Lake Tahoe is an exciting destination in all seasons, and ownership at Tahoe Summit Village might be the best way to take advantage of it. Found in Stateline, Nevada, the resort is ideally situated to enjoy water-based summer adventures and winters on the slopes. With these Lake Tahoe timeshare resales, you'll enjoy fantastic getaways every year. From every window in the Tahoe Summit Village there's another spectacular view. The property sits at the edge of the picturesque Carson Valley with the Heavenly Valley Ski Resort located immediately behind it. With the famous lake being just four miles away, it's easy to escape there for some swimming, sailing or just lazing on the shore. Adventurous guests may also want to give parasailing and windsurfing a try. The fun doesn't end when the snow arrives. Some of the best skiing in the country is found close to the resort, so guests will have a wonderful time no matter when they visit. People who choose these Lake Tahoe timeshare resales tend to enjoy active vacations. That's why this resort likes to focus on relaxation. The Jacuzzi is the ideal spot to relax and unwind. Additional amenities, like a swimming pool and gym, are available at a nearby, related property. The timeshare condominiums all have two bedrooms, so there is plenty of room for the whole family. Depending upon their configuration, the condos can sleep either six or eight guests with ease. The stone fireplaces are an especially cozy touch in the winter, but they can also be welcome after a summer sunset. Full kitchens make it a snap for families to prepare hearty, home-cooked meals. Wall units have washers and dryers to ensure a convenient stay. 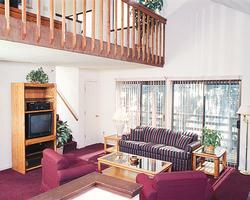 Anyone who is looking for a cozy mountain retreat is certain to fall in love with the Tahoe Summit Village. The friendly staff, perfect location and convenient access to all of the activities that are available in the region make this resort an ideal choice for travelers of all descriptions. 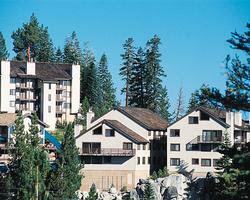 Choose Lake Tahoe timeshare resales if you want to own a piece of this remarkable place. Contact Tahoe Summit Village Specialist Today!